Where would you even fit the word Barclays on this sign? The MTA officially has sold naming rights to one of its busiest subway stations in Brooklyn. That means McDonald's 42nd Street and Taco Bell 59th Street-Columbus Circle could be right around the corner -- or not. Sell the name of a station to an advertiser: It's a business strategy the cash-strapped agency has been developing for years. But no one has been willing to pay up until now. Strangely enough, it's a London-based bank that wants first dibs on subway stops at Atlantic Avenue/Pacific Street transit hub. The $4 million deal got approved today, which means all of the subway stations at the busy Brooklyn hub will have Barclays Center added to their names. Why does a British bank with a Manhattan office want its name on Crooklyn subway stations? Barclays Center, the sports stadium intended to be the center of the Atlantic Yards project, will be finished in the next few years. And Atlantic Yards' developer Forest City Ratner offered the MTA $200,000 annually over the next two decades to change the name of the second most bustling station in Brooklyn to reflect the focal point of its $4.9-billion project. If one company can buy rights to change the name of subway stations, a New Yorker might ask, what's next? Coca-Cola 59th Street-Lex? Pepsi 5th Avenue-53rd? Either and more could be on the horizon if the MTA has its way. In the past, subway stations used to be named based on where they were located, but the MTA is jumping on the chance to raise revenue for the transit system by allowing advertisers to buy in. "It’s always a question of balancing our need for revenue and our stewardship of public space,” MTA spokesman Jeremy Soffin told The New York Times. But just because a company wants to brand itself on a subway station doesn't mean the advertising will work in its favor. No one's going to buy an ad that doesn't make sense. That's not going to stop companies from trying. The Barclays name change is scheduled for 2012 in line with the opening of the new arena. 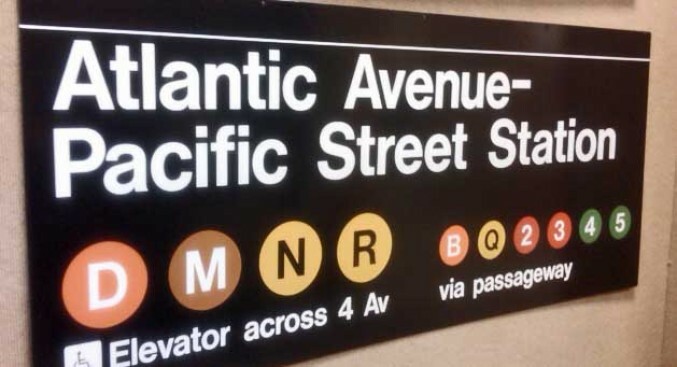 Forest City Ratner would pay for the new signs and the MTA would slowly incorporate the name change into city maps once the stadium opens, the Times reports. All of this could hinge on a deal for the Vanderbilt Yard -- a process that has been embroiled in controversy since the project was announced six years ago. The MTA is expected to vote this morning on a proposed payment plan for Forest City Ratner. The Empire State Development Corporation voted yesterday that the company only has to pay the MTA $20 million upfront to acquire the land and start work. However, that would apply only if the agency can find buyers for its tax-exempt bonds for the project, according to The New York Post. Initially, Ratner was supposed to pay a one-time amount of $100 million before construction began. If the new deal is approved, the company would have more than two decades to pay off the rest of the multi-billion-dollar 22-acre development. "This is crazy. The MTA needs this cash now to invest in physical assets like subway cars and signal refurbishment; its budget for these areas already faces a huge cash shortfall," wrote the Manhattan Institute's Nicole Gelinas in a Post op-ed. "Remember, the MTA is so cash-strapped that it had to beg the state for a permanent $2 billion-a-year bailout a couple of months back. Yet now, in effect, it's proposing to lend money to a speculative developer at a 6.5 percent interest rate for decades. That rate is laughable." The whole thing is laughable, according to the watchdogs who've been bemoaning it for years . When the project was announced in 2003, it was slated to open in 2006. It was supposed to include vast public benefits -- affordable housing, cool architecture and jobs for minorities -- that earned the site hundreds of millions in tax breaks but have since disappeared. "Every year the goalposts move," Norman Oder cautions on his blog. Oder doesn't pin all his ire on Ratner or the MTA, however. He partially blames the media for going along with it because of their own interests. "The New York Times, which yesterday offered a truncated and contemptible print account of the deal expected between the Metropolitan Transportation Authority and Forest City Ratner for the Vanderbilt Yard, today offers a lengthy, fluffy story headlined M.T.A. Sells Naming Rights to Subway Station," he wrote in the Atlantic Yards Report. "A little skepticism--or at least a little hedging--is in order, especially since FCR is the parent New York Times Company's business partner in the Times Tower."